One of the parts of the competition is for fun and yet it is proving difficult. Find the hidden story (A Meeting of Souls) and the map on my website (see the rules in the link below). 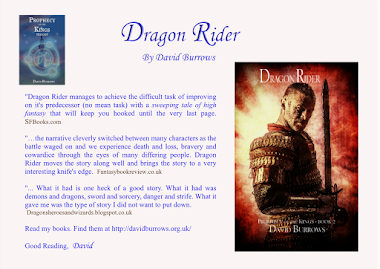 Hint: pay careful attention to the navigation bar links on my website http://www.davidburrowsfantasyauthor.com/. You don't need to scroll pages down so don't spend too long. It shouldn't take long to find the map or the story. On the author interview questions, as well as writing I do re-enactment. I fight as a Saxon warrior and have broken my fingers several times and my ribs twice! Got to be a good question in that somewhere. Trying to be a hero! Went for a walk in the park and saved a caterpillar which was trundling across the tarmacked path. It would have been easy prey for a bird. Then I saved some chaps kite. It was blowing away with the string trailing behind it. I had to throw myself on the string as it was impossible to grab. Great heroics all in one day. Who needs Batman! 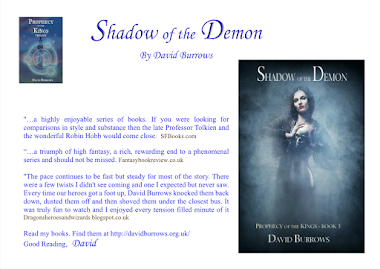 Three copies of Prophecy of the Kings Trilogy (by David Burrows) will be given to readers who participate in the giveaway - see http://www.risingshadow.net/news/261-giveaway-prophecy-of-the-kings-trilogy-by-david-burrows. Send the links to a hidden story and a hidden map or an interview question to this e-mail address: risingshadow.giveaway@gmail.com. You must give a valid e-mail address, name and mailing address. Subject of the e-mail message must be: PROPHECY. 2. George Martin's Game of Thrones. Brilliant series, but where is it going and who will be left in it? Lots of good characters and Tyrion Lanister is definitely a favourite. What a great character. So cool and flippant under pressure. The TV series (I'm on the second series) is excellent, but already taking significant short cuts over the books! 6. Weiss and Hickmann - Raistlin is my favourite character and the War of the Twins novels my favourite series. This is the original Dungeons and Dragons story for me. Time travel is dealt with brilliantly and is quite spooky in its way. 8. Elle Casey - War of the Fae. Only read book 1 to date but I was impressed. Some discrepancies in the tale I would like to understand and I have written to Elle to ask. didn't detract from the enjoyment and book 2 may explain. 9. Markus Heitz - Dwarves. OK - be patient. I almost gave up and could have skipped the first 100 pages or so but it certainly improves and is a very good read (eventually). 10. Edgar Rice Burroughs - Mars series. Nostalgic value for me as this was my first read. 11. David Gemmell - Druss is my favourite character in the Legend of Druss. Well worth a read. Other books by this author are good but some less so. The Greek series was poor. 12. Joe Abercrombe - The Blade Itself and in particular Glokta. One of the best characters for a while. Very readable books but a little meandering with a long build up in the plot. Excellent for those that like politics in a fantasy novel. This is full of intrigue. 13. Michael Moorcock - He has written many good books, my favourite character were Elric, Hawkmoon and Corum. I really liked the Eternal Champion concept, bring several heroes together for one epic battle. Jerry Cornelious series based at the end of time is a good read as well. 14. Robin Hobb and the Farseer and Tawny Man Trilogies were excellent. I found the Mad Ship series was very difficult to get into. 15 Stan Nicholls, Orcs. Quite a brutal tale. 16. Raymond Feist and Magician and Talon of the Silver Hawk. I far preferred Magician and if all his novels were of this standard he would have been higher on my list. Magician is a seriously good read. 17. James Clemens - The Wit'ch Fire series. I need to reread this series. I don't remember much from it which may be a bad sign. 18. Robert Jordan - Wheel of Time series. Book 9 was a stinker. Nothing really happened and it was so bad I gave up on the series. I have since read book 11, having been persuaded to continue and again found much of the story to be too slow. Book 12 (by another author) is starting to look promising. this was a cracking series to start with and books 1-3 were really good. such a shame. Book 12 was OK and book 13 was excellent. One more book to go! This is Indigo Primes' final review for book 3 of the Prophecy of the Kings; Shadow of the Demon. What a nice review. I can't overstate how much I enjoyed these books. This book proved a worthy successor to the second book, Dragon Rider. Here, the reader shares various different perspectives on the same situation. I don't want to spoil any of the tension David Burrows creates in this brilliant story. Let it suffice to say that there are some dark and challenging times here. 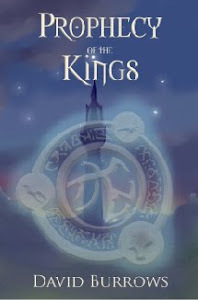 Throughout the Prophecy of the Kings the author keeps you turning pages to find out what will happen next. My only disappointment was in reaching the end! Encore! More, more . . ."
Currently discounted on Shadow of the Demon, on Amazon - Give it a try! Hope you enjoy. I saw Stardust in the cinema and for some reason the film appealed to me at every level. This was the same. For a while I thought it may be a run of the mill vampire book, but I was very pleasantly surprised. It's a beautifully crafted book with a lot going for it. Characterisation is very good and the tale has lots of twists and turns, and originality. 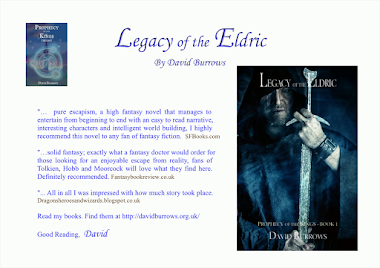 It is primarily for fantasy fans but I expect a great many other readers would also enjoy this. A terrific book.